Take a big bowl and mix all the vegetables, salt and add cornflour or maida in it. Bind the ingredients together without adding water. Make small lemon size balls and keep aside. Heat oil in a wok and fry the prepared vegetable balls a few at a time till they become golden brown in colour. Take out the balls and keep on a tissue paper to let the excess oil drain. Take another wok and add 3 tsps. of oil, add diced garlic and onion in it and fry till onion become translucent in colour. Mix 4 tsp of soya sauce, 2 tsp of vinegar and 2 tsp of cornflour in a glass of water. Pour this water in the wok with garlic and onion. Let it simmer till the gravy become thick, take off from fire and let it cool. Add the fried Manchurian balls just before serving, else the balls will soak all the gravy. 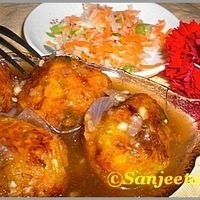 A tasty weekend treat of easy vegetable Manchurian is ready to serve. Recipe & Food Styling | Shahi Mushroom Curry – To jump off the cliff and learn how to make wings on the way down.. Recipe & Food styling | Okra in coconut milk – When life revolves around food….